Tom Probert from Hamble, Hampshire has won a national graphic design competition organised by leading London brand design agency Coley Porter Bell. Created to spot the next generation of design talent, Probert’s winning design, a poster to advertise the following year’s competition, was chosen from a shortlist of nine finalists (whittled down from over 100 entries from 2nd year graphic design students at colleges across the UK). He is currently in his final year of a degree course at University College Falmouth. 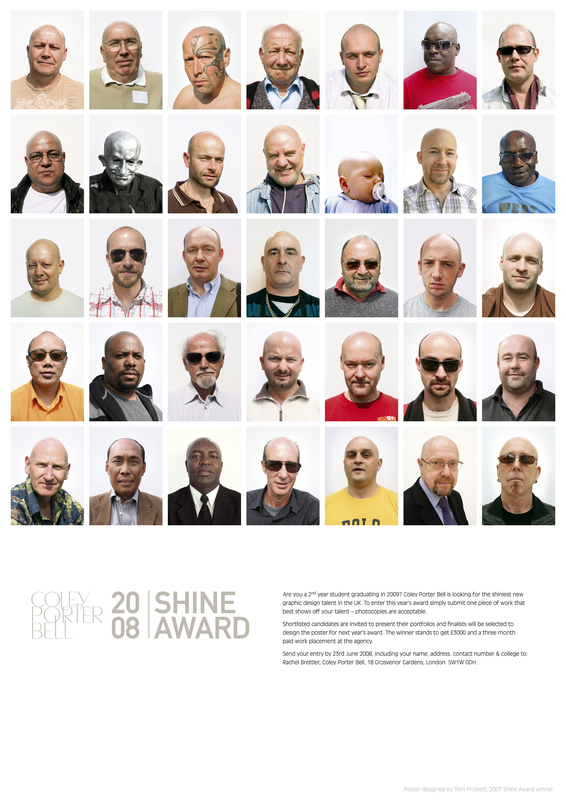 A play on the competition name, SHINE, the winning poster shows 35, shiny, bald headed men. The judges felt Probert’s design showed lateral thought, wit and would appeal to the student audience. Tom wins £3,000 and three months paid work at brand design agency Coley Porter Bell, the competition organisers. The judging panel included Tracey Waller, Course Director, Chelsea College of Art & Design, Stephen Bell, creative director at Coley Porter Bell together with Simon Adamson, Coley Porter Bell’s design director and Sarah Denyer, international marketing manager at Chivas Brothers, sponsors of the competition. 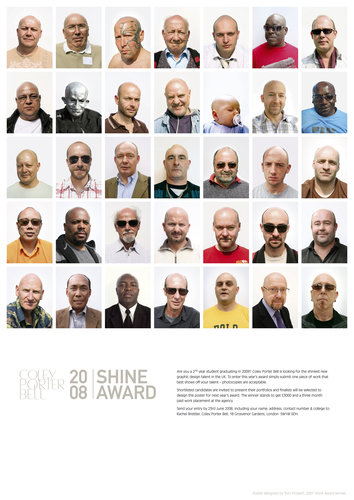 Shine is an annual competition run by brand design agency Coley Porter Bell open to graphic design students in the UK. This press release was distributed by ResponseSource Press Release Wire on behalf of Coley Porter Bell in the following categories: Education & Human Resources, Media & Marketing, for more information visit https://pressreleasewire.responsesource.com/about.